The Utah Rivers Council has initiated a new water conservation campaign for Utah called 40 by 30. We seek to lower Utah’s municipal water use to 175 gallons per person per day (gpcd) which is equivalent to the water use of Denver and hundreds of other U.S. cities. This reduction would represents a 40% reduction by the year 2030. Although a 40% reduction in water use may sound ambitious, the Utah Division of Water Resources claims Utah has reduced water use 18% from the water use in the year 2000, meaning Utah is already about halfway to achieving the 40% goal. If Utah’s cities reduced their per capita water use to 175 gpcd there would be no need for Bear River Development. By simply reducing our municipal water use to 175 gpcd, we could save billions of dollars in spending and avoid the impacts of Bear River Development on ecosystems and local communities. Reducing our water demand to 175 gpcd can be achieved without compromising our lifestyles. Although this is good news to taxpayers, it is important to understand that some of the vested interests seeking to receive the $6 billion in new public spending, including $2.5 billion from proposed Bear River Development, are more interested in receiving this money than in reducing water use. This is why they perpetuate the myth Utah is running out of water. This opposition to water conservation has been pervasive at the Division of Water Resources. Its former Director, Dennis Strong, coined Strong’s Law, which was presented at the State Water Development Commission on August 14, 2012. Strong’s Law is defined as, “If water is conserved, something has to die.” It’s astonishing to hear an agency charged with leading the state’s water conservation initiatives misinforming people that something has to die to save water. 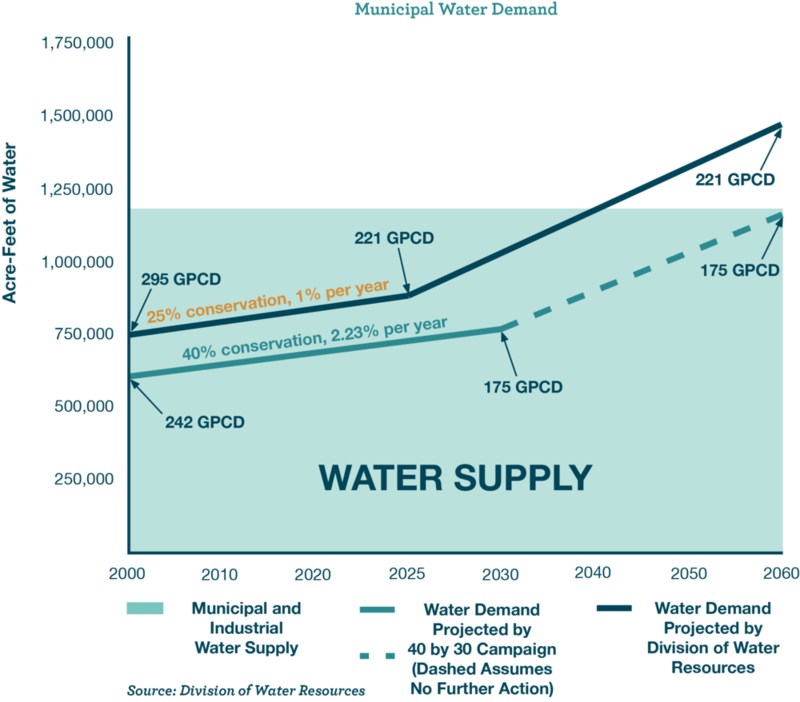 The water demand chart below shows the reduction in water demand that would accrue if we reduced our municipal water use to 175 gpcd, the same amount of water that residents in Denver use today. This would save Utahns $6 billion in future spending and large increases to their water rates. The dotted line shows the 40% water conservation campaign and the solid, dark blue line shows the projection by the Utah Division of Water Resources.